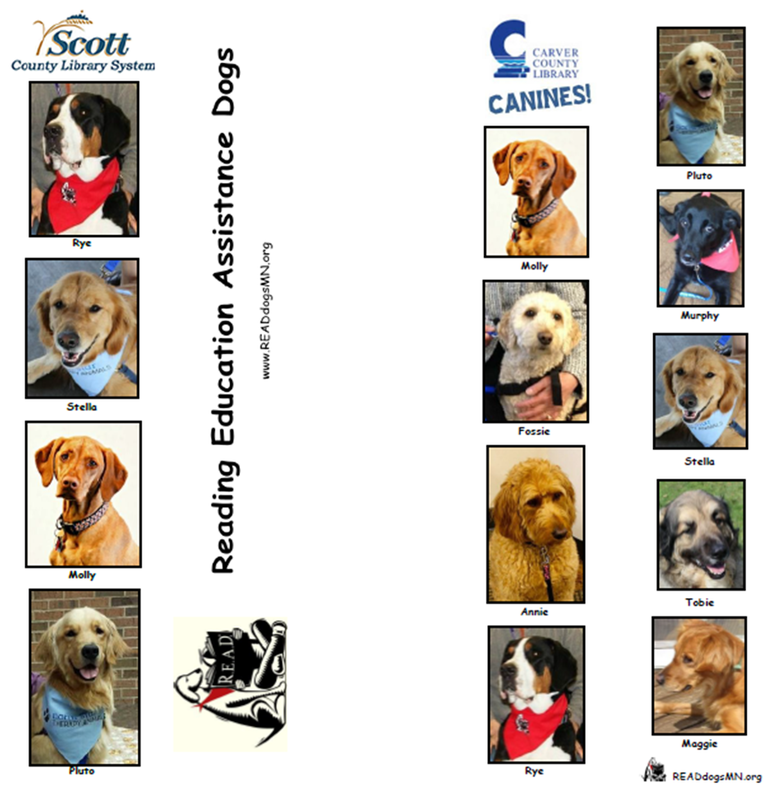 Current news and updates are located on the Reading Education Assistance Dogs MN Facebook page. Click here for the R.E.A.D. MN Facebook page. 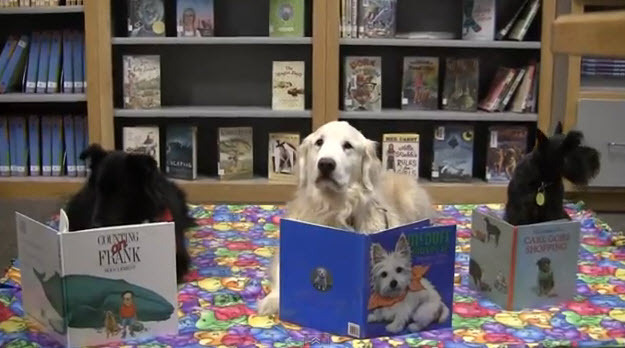 There are reading with dog programs in all of the seven county metro area libraries. Two programs that are very active are in Carver County and in Scott County and, like the program in Hennepin County, the services are provided by the R.E.A.D. teams from the North Star Therapy Animals. Here is a wonderful video created by Connie Priesz of the dedicated teams involved in the programs. The Carver & Scott R.E.A.D. teams celebrated another successful year of R.E.A.D.ing with a party today! Check out a few of the pictures from the celebration here. A BIG thank you to all the R.E.A.D. teams that continue to volunteer there time to our communities' young readers! These are special bookmarks commemorating the teams for each program. And, to Julie and Nancy for providing information to the visitors to the R.E.A.D. booth. Here's a great paper that "addresses to the most commonly raised objections to allowing dogs in classrooms and patient rooms and offers practical guidelines for maximizing the positive outcomes of animal assisted activities and therapy." Does a Person's Familiarity Affect a Dog's Obedience? You know as a therapy animal handler that you are to keep a hold of your animal's leash at all times. There are many reasons for that and Stanley Coren's recent article, Does a Person’s Familiarity Affect a Dog’s Obedience?, highlights one of them. A dog will respond more readily to the owner than to a either a familiar person or an unfamiliar person. Published on April 7, 2014 by David Sack, M.D. Winston Churchill said, “There is something about the outside of a horse that is good for the inside of a man,” he may have been more right than he realized. A growing body of research is beginning to confirm what has long been observed anecdotally – that animals can help us heal in ways both physical and psychological. What is it about animals that can help us get back on track? Animals share a deep, genetic bond with us. Animals give us immediate, honest feedback. Animals lower barriers to communication. Animals are physically and psychologically comforting. Animals allow us to practice relationships. Animals take us outside ourselves. Animals teach us responsibility and self-control. Animals bring touch back to therapy.